Another two-color study, this time using Burnt Sienna instead of Burnt Umber, along with the Ultramarine Blue. As an aside, looking up lists of “warm” and “cool” colors, the umber and ultramarine are considered “warm” by some. Beats me, as they sure look icy together. Here, the Burnt Sienna alone or diluted is warm in cast, but moves to dark and cold (in my eye) when combined with the Ultramarine Blue. Painting flowers well is a lot more difficult than it seems. Part of it is just getting the colors correct, and the shadows. A sense of depth and shape is not quickly achieved for me at present – I am still trying to get that. Still, doing a quick morning watercolor before work is a good exercise as I think about various things. 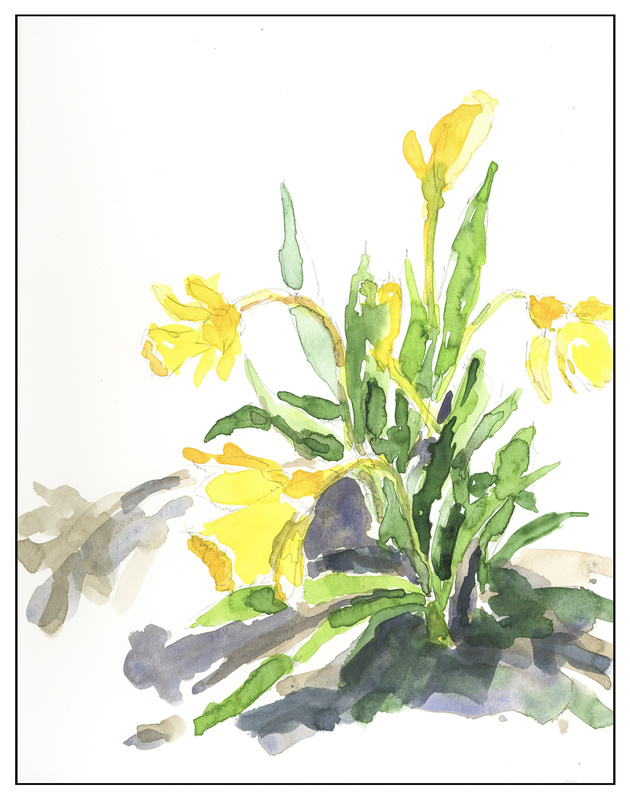 This daffodil is from this morning – I spent about 20 minutes on it from beginning to end before getting ready for work. Tonight, I plan to do another daffodil, preparing for it by making a value study in pencil. This morning’s painting, and yesterday’s, were done directly onto the paper, preceded by a pencil sketch on the paper. Let’s see if a value sketch proves to lead to a more successful sense of contrast and depth. Another study in Burnt Umber and Ultramarine Blue. Cold, wintry colors. Here is a study done to practice laying down a gradated wash. Using a strong blue wash, I started at the top, then went all the way to the bottom, lighter by adding more water. 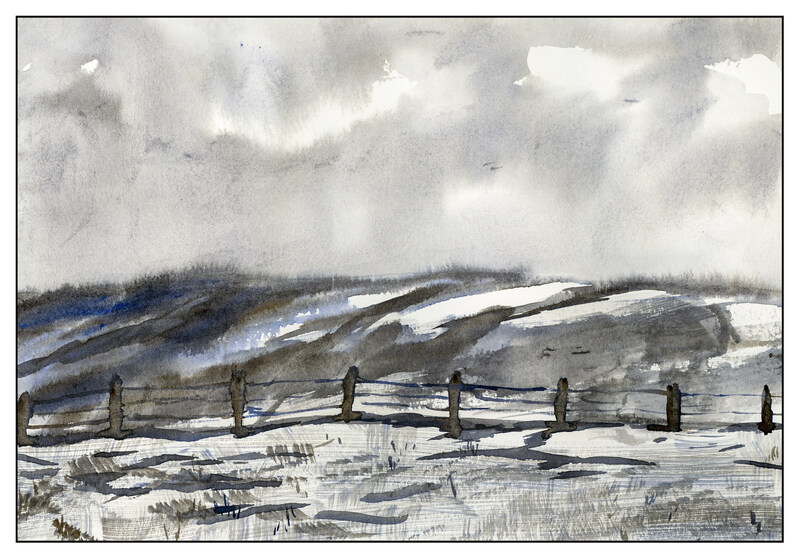 Then, starting at the bottom, I used a dry brush to begin removing the wash, bottom up, until I reached the horizon. From there, a mixture of blue and brown to create the blurred trees in the distance. Then trees, shadows, and the shading under the trees. 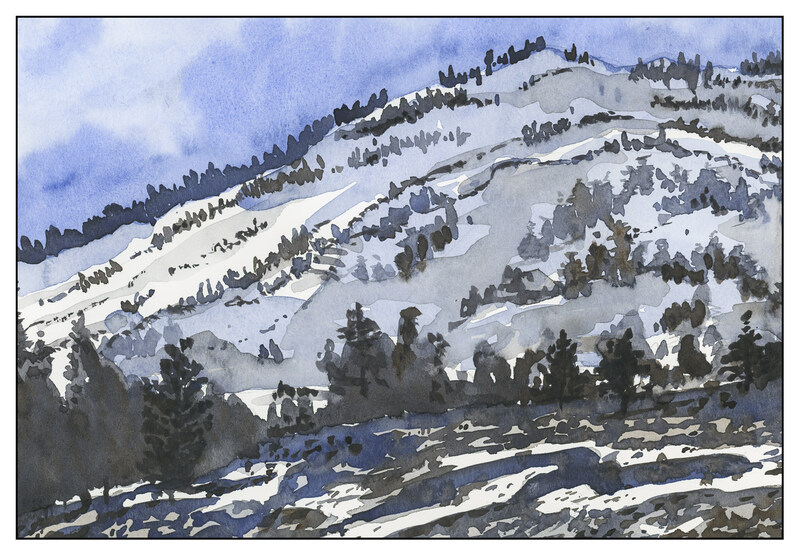 The paper is not the best for heavy washes – there is a bit of puddling – but the exercise of wash and 2 colors worked. 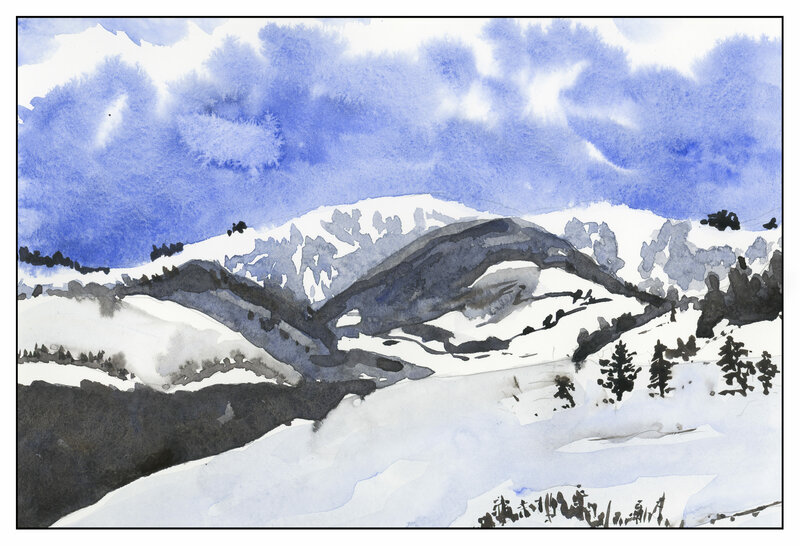 Finally, I took some white gouache on a toothbrush and splattered it to create the effect of snow. Maybe this is really a 3-color study? Daffodil season! 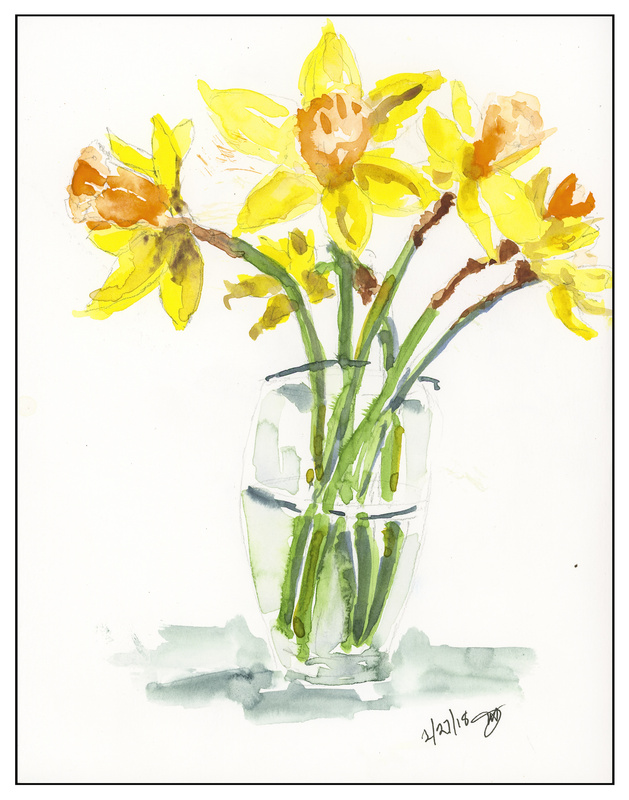 I decided that as spring approaches, daffodils are some of the best – and most complex – flowers to paint. Here is my attempt this morning before work. Last summer we drove through a lot of the wild west. The loneliness of Wyoming always gets me – vistas of open space, few cars, fewer people. Taking a picture during the summer is much different than what you see in winter, so I looked at some of the photos I took out of the window as we drove from Laramie to the Tetons. I tried to imagine how barren and cold it could be. Always the sky, always the distance, always the barbed wire fences. Again, in Ultramarine Blue and Burnt Sienna. Besides trying to imagine a scene, I also tried out a new brush. It is a Cosmotop flat, by DaVinci brushes of Germany; it’s about 3/4″ wide. I wanted to see how it would do on the Canson XL paper I use for practice, in particular to see if I could get a “sparkly” effect with a dry brush. The paper is too smooth for that to work successfully, which is why there are fine lines in the foreground. (Sigh.) It did a pretty good job for wet-in-wet sky, and along the horizon line. Another study in Ultramarine Blue and Burnt Umber. 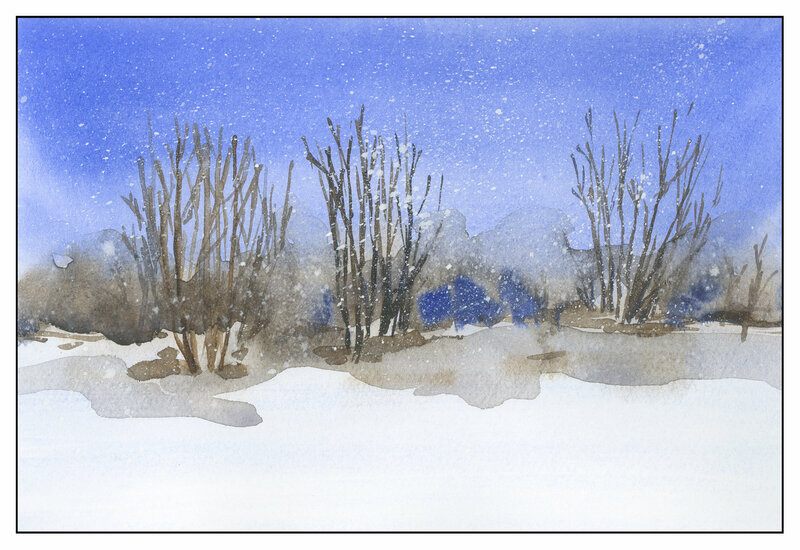 These are really good colors for portraying cold and wintry conditions. Brr! Where I live, we have had weather in the 80s for much of January and February, so a break from the heat is much needed. Today, though, it’s a whopping 52 F.
One nice thing about working in only two colors, you don’t get mud. You get dark colors. You get light colors. You get medium colors. I find that this is actually harder to do, in some ways, and easier, too. 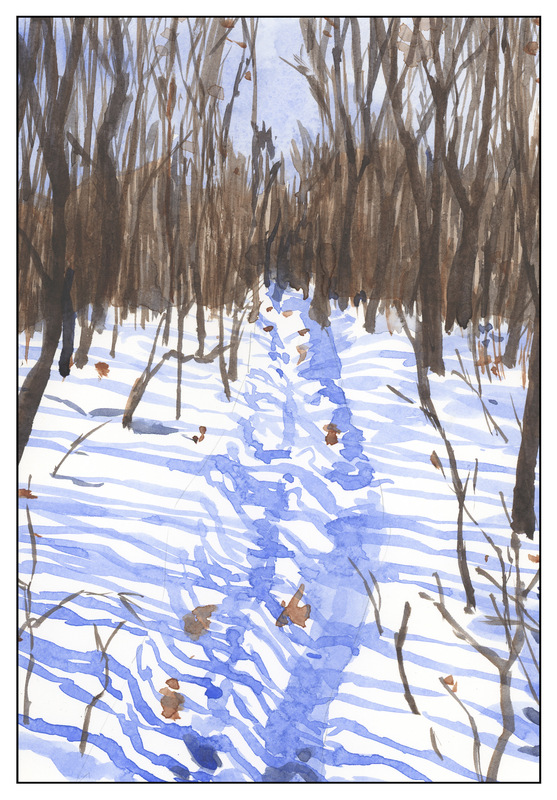 Harder because I have to decide on value (light, dark) and which direction to push the color (blue, brown). It’s easier as the decisions of color are already made for you (me, the painter!). Here I have limited my palette to Ultramarine Blue and Burnt Umber, as in the earlier studies from Ted Kautzky I did last week. After looking at the scan, I realize that some of my darker trees in the foreground sort of float in space! The lighting at present makes it hard to see, but I will probably go back and correct it later on.